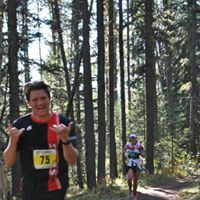 Join us for the 10th Annual Blitz Duathlon in beautiful Bragg Creek west of Calgary, AB. This race features a 7k intermediate trail run, ~19k road bike (out and back), and ends with a challenging 3.5k trail run. Open to individuals or teams of two (1 runner/1 cyclist). Fun and challenging for all ages and abilities. Great prizes and food follow the race! Sells out every year so be sure to register early. A great opportunity to celebrate “the spirit of a road race” and a super fun day in the beautiful rockies!